For other uses, see Electric guitar (disambiguation). The electric signal can be electronically altered to change the timbre of the sound. Often, the signal is modified using effects such as reverb, distortion and "overdrive"; the latter is considered to be a key element of electric blues guitar music and rock guitar playing. Invented in 1931, the electric guitar was adopted by jazz guitar players, who wanted to play single-note guitar solos in large big band ensembles. Early proponents of the electric guitar on record include Les Paul, Lonnie Johnson, Sister Rosetta Tharpe, T-Bone Walker, and Charlie Christian. During the 1950s and 1960s, the electric guitar became the most important instrument in popular music. It has evolved into an instrument that is capable of a multitude of sounds and styles in genres ranging from pop and rock to country music, blues and jazz. It served as a major component in the development of electric blues, rock and roll, rock music, heavy metal music and many other genres of music. Electric guitar design and construction varies greatly in the shape of the body and the configuration of the neck, bridge, and pickups. Guitars may have a fixed bridge or a spring-loaded hinged bridge, which lets players "bend" the pitch of notes or chords up or down, or perform vibrato effects. The sound of an electric guitar can be modified by new playing techniques such as string bending, tapping, and hammering-on, using audio feedback, or slide guitar playing. There are several types of electric guitar, including: the solid-body guitar; various types of hollow-body guitars; the six-string guitar (the most common type), which is usually tuned E, B, G, D, A, E, from highest to lowest strings; the seven-string guitar, which typically adds a low B string below the low E; and the twelve-string guitar, which has six pairs of strings. In pop and rock music, the electric guitar is often used in two roles: as a rhythm guitar, which plays the chord sequences or progressions, and riffs, and sets the beat (as part of a rhythm section); and as a lead guitar, which provides instrumental melody lines, melodic instrumental fill passages, and solos. In a small group, such as a power trio, one guitarist switches between both roles. In large rock and metal bands, there is often a rhythm guitarist and a lead guitarist. Electric guitars were originally designed by acoustic guitar makers and instrument manufacturers. The demand for amplified guitars began during the big band era; as orchestras increased in size, guitar players soon realized the necessity in guitar amplification & electrification. 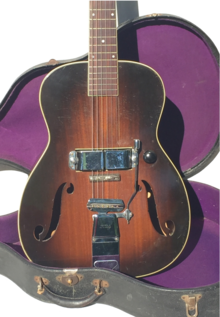 The first electric guitars used in jazz were hollow archtop acoustic guitar bodies with electromagnetic transducers. 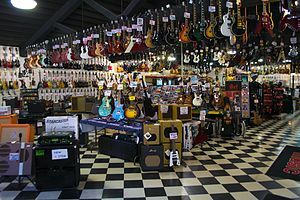 Early electric guitar manufacturers include Rickenbacker in 1932; Dobro in 1933; National, AudioVox and Volu-tone in 1934; Vega, Epiphone (Electrophone and Electar), and Gibson in 1935 and many others by 1936. The first electrically amplified stringed instrument to be marketed commercially was designed in 1931 by George Beauchamp, the general manager of the National Guitar Corporation, with Paul Barth, who was vice president. The maple body prototype for the one-piece cast aluminium "frying pan" was built by Harry Watson, factory superintendent of the National Guitar Corporation. Commercial production began in late summer of 1932 by the Ro-Pat-In Corporation (Electro-Patent-Instrument Company), in Los Angeles, a partnership of Beauchamp, Adolph Rickenbacker (originally Rickenbacher), and Paul Barth. In 1934, the company was renamed the Rickenbacker Electro Stringed Instrument Company. In that year Beauchamp applied for a United States patent for an Electrical Stringed Musical Instrument and the patent was later issued in 1937. 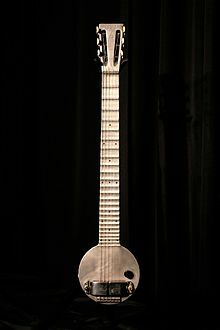 By early-mid 1935, Electro String Instrument Corporation had achieved mainstream success with the A-22 "Frying Pan" steel guitar, and set out to capture a new audience through its release of the Electro-Spanish Model B and the Electro-Spanish Ken Roberts, which was the first full 25" scale electric guitar ever produced. The Electro-Spanish Ken Roberts was revolutionary for its time, providing players a full 25" scale, with easy access to 17 frets free of the body. Unlike other lap-steel electrified instruments produced during the time, the Electro-Spanish Ken Roberts was designed to play standing vertical, upright with a strap. The Electro-Spanish Ken Roberts was also the first instrument to feature a hand-operated vibrato as a standard appointment, a device called the "Vibrola," invented by Doc Kauffman. It is estimated that fewer than 50 Electro-Spanish Ken Roberts were constructed between 1933 and 1937; fewer than 10 are known to survive today. Gibson's first production electric guitar, marketed in 1936, was the ES-150 model ("ES" for "Electric Spanish", and "150" reflecting the $150 price of the instrument, along with matching amplifier). 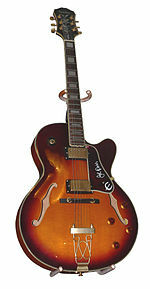 The ES-150 guitar featured a single-coil, hexagonally shaped "bar" pickup, which was designed by Walt Fuller. It became known as the "Charlie Christian" pickup (named for the great jazz guitarist who was among the first to perform with the ES-150 guitar). The ES-150 achieved some popularity but suffered from unequal loudness across the six strings. A functioning solid-body electric guitar was designed and built in 1940 by Les Paul from an Epiphone acoustic archtop. His "log guitar" —— a wood post with a neck attached and two hollow-body halves attached to the sides for appearance only — shares nothing in common for design or hardware with the solid-body Gibson Les Paul later introduced in 1952. The feedback associated with amplified hollow-bodied electric guitars was understood long before Paul's "log" was created in 1940; Gage Brewer's Ro-Pat-In of 1932 had a top so heavily reinforced that it essentially functioned as a solid-body instrument. In 1945, Richard D. Bourgerie made an electric guitar pickup and amplifier for professional guitar player George Barnes. Bourgerie worked through World War II at Howard Radio Company, making electronic equipment for the American military. Barnes showed the result to Les Paul, who then arranged for Bourgerie to have one made for him. Early proponents of the electric guitar on record include Alvino Rey (Phil Spitalney Orchestra), Les Paul (Fred Waring Orchestra), George Barnes (under many aliases), Eddie Durham, Lonnie Johnson, Floyd Smith, Sister Rosetta Tharpe, Big Bill Broonzy, T-Bone Walker, George Van Eps, Charlie Christian (Benny Goodman Orchestra), Tampa Red, Memphis Minnie, and Arthur Crudup. According to jazz historian James Lincoln Collier, Floyd Smith can be credited as the first person to rig up an amplified guitar. According to Collier, "Floyd's Guitar Blues" may be the first important use of the electric guitar on record. One of the first solid-body guitars was invented by Les Paul. Gibson did not present their Gibson Les Paul guitar prototypes to the public, as they did not believe the solid-body style would catch on. Another early solid-body Spanish style guitar, resembling what would become Gibson's Les Paul guitar a decade later, was developed in 1941 by O.W. Appleton, of Nogales, Arizona. Appleton made contact with both Gibson and Fender but was unable to sell the idea behind his "App" guitar to either company. In 1946, Merle Travis commissioned steel guitar builder Paul Bigsby to build him a solid-body Spanish-style electric. Bigsby delivered the guitar in 1948. The first mass-produced solid-body guitar was Fender Esquire and Fender Broadcaster (later to become the Fender Telecaster), first made in 1948, five years after Les Paul made his prototype. The Gibson Les Paul appeared soon after to compete with the Broadcaster. 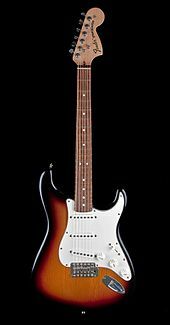 Another notable solid-body design is the Fender Stratocaster, which was introduced in 1954 and became extremely popular among musicians in the 1960s and 1970s for its wide tonal capabilities and more comfortable ergonomics than other models. The history of Electric Guitars is summarized by Guitar World magazine, and the earliest electric guitar on their top 10 list is the Ro-Pat-In Electro A-25 "Frying Pan" (1932) described as 'The first-fully functioning solid-body electric guitar to be manufactured and sold'. The most recent electric guitar on this list is the Ibanez Jem (1987) which featured '24 frets', 'an impossibly thin neck' and was 'designed to be the ultimate shredder machine'. Numerous other important electric guitars are on the list including Gibson ES-150 (1936), Fender Telecaster (1951), Gibson Les Paul (1952), Gretsch 6128 Duo Jet (1953), Fender Stratocaster (1954), Rickenbacker 360/12 (1964), Van Halen Frankenstein (1975), Paul Reed Smith Custom (1985) many of these guitars were 'successors' to earlier designs. Electric Guitar designs eventually became culturally important and visually iconic, with various model companies selling miniature model versions of particularly famous electric guitars, for example the Gibson SG used by Angus Young from the group AC/DC. Some solid-bodied guitars, such as the Gibson Les Paul Supreme, the PRS Singlecut, and the Fender Telecaster Thinline, are built with hollow chambers in the body. These chambers are designed to not interfere with the critical bridge and string anchor point on the solid body. In the case of Gibson and PRS, these are called chambered bodies. The motivation for this may be to reduce weight, to achieve a semi-acoustic tone (see below) or both. Semi-acoustic guitars have a hollow body (similar in depth to a solid-body guitar) and electronic pickups mounted on the body. They work in a similar way to solid-body electric guitars except that, because the hollow body also vibrates, the pickups convert a combination of string and body vibration into an electrical signal. Whereas chambered guitars are made, like solid-body guitars, from a single block of wood, semi-acoustic and full-hollowbody guitars bodies are made from thin sheets of wood. They do not provide enough acoustic volume for live performance, but they can be used unplugged for quiet practice. Semi-acoustics are noted for being able to provide a sweet, plaintive, or funky tone. They are used in many genres, including blues, funk, sixties pop, and indie rock. They generally have cello-style F-shaped sound holes. These can be blocked off to prevent feedback, as in B. B. King's famous Lucille. Feedback can also be reduced by making them with a solid block in the middle of the soundbox. Full hollow-body guitars have large, deep bodies made of glued-together sheets, or "plates", of wood. They can often be played at the same volume as an acoustic guitar and therefore can be used unplugged at intimate gigs. They qualify as electric guitars inasmuch as they have fitted pickups. Historically, archtop guitars with retrofitted pickups were among the very earliest electric guitars. The instrument originated during the Jazz Age, in the 1920s and 1930s, and are still considered the classic jazz guitar (nicknamed "jazzbox"). Like semi-acoustic guitars, they often have f-shaped sound holes. Having humbucker pickups (sometimes just a neck pickup) and usually strung heavlly, jazzboxes are noted for their warm, rich tone. A variation with single-coil pickups, and sometimes with a Bigsby tremolo, has long been popular in country and rockabilly; it has a distinctly more twangy, biting tone than the classic jazzbox. The term archtop refers to a method of construction subtly different from the typical acoustic (or "folk" or "western" or "steel-string" guitar): the top is formed from a moderately thick (1 inch (2.5 cm)) piece of wood, which is then carved into a thin (0.1 inches (0.25 cm)) domed shape, whereas conventional acoustic guitars have a thin, flat top. The one-string guitar is also known as the Unitar. Although rare, the one-string guitar is sometimes heard, particularly in Delta blues, where improvised folk instruments were popular in the 1930s and 1940s. Eddie "One String" Jones had some regional success. Mississippi blues musician Lonnie Pitchford played a similar, homemade instrument. In a more contemporary style, Little Willie Joe, the inventor of the Unitar, had a rhythm and blues instrumental hit in the 1950s with "Twitchy", recorded with the Rene Hall Orchestra. Seven-string electric guitars were popularized among rock players in the 1980s by Steve Vai. Along with the Japanese guitar company Ibanez, Vai created the Universe series seven-string guitars in the 1980s, with a double locking tremolo system for a seven-string guitar. These models were based on Vai's six-string signature series, the Ibanez Jem. Seven-string guitars experienced a resurgence in popularity in the 2000s, championed by Deftones, Limp Bizkit, Slayer, KoRn, Fear Factory, Strapping Young Lad, Nevermore, Muse and other hard rock and metal bands. Metal musicians often prefer the seven-string guitar for its extended lower range. The seven-string guitar has also played an essential role in progressive metal rock and is commonly used in bands such as Dream Theater and Pain of Salvation and by experimental guitarists such as Ben Levin. In 2008, Ibanez released the Ibanez RG2228-GK, the first mass-produced eight-string guitar. Another Ibanez player is Tosin Abasi, lead guitarist of the progressive metal band Animals as Leaders, who uses an Ibanez RG2228 to mix bright chords with very heavy low riffs on the seventh and eighth strings. Ibanez has since released several lines of nine string guitars that are similar to their eight string line but with an additional string. George Harrison of the Beatles and Roger McGuinn of the Byrds brought the electric twelve-string to notability in rock and roll. During the Beatles' first trip to the United States, in February 1964, Harrison received a new 360/12 model guitar from the Rickenbacker company, a twelve-string electric made to look onstage like a six-string. He began using the 360 in the studio on Lennon's "You Can't Do That" and other songs. McGuinn began using electric twelve-string guitars to create the jangly, ringing sound of the Byrds. Both Jimmy Page, the guitarist with Led Zeppelin, and Leo Kottke, a solo artist, are well known as twelve-string guitar players. The third-bridge guitar is an electric prepared guitar with an additional, third bridge. This can be a normal guitar with, for instance, a screwdriver placed under the strings, or it can be a custom-made instrument. Lee Ranaldo of Sonic Youth plays a third-bridge instrument. In the 1980s, Bradford Reed built his two-neck "pencilina" and continues to perform with it. 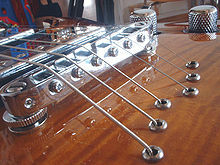 Double-neck (or, less commonly, "twin-neck") guitars enable guitarists to play both guitar and bass guitar or, more commonly, both a six-string and a twelve-string. In the mid-1960s, one of the first players to use this type of guitar was Paul Revere & the Raiders' guitarist Drake Levin. Another early user was John McLaughlin. The double-neck guitar was popularized by Jimmy Page, who used a custom-made, cherry-finished Gibson EDS-1275 to perform "Stairway to Heaven", "The Song Remains the Same" and "The Rain Song", although for the recording of "Stairway to Heaven" he used a Fender Telecaster and a Fender XII electric twelve-string. Mike Rutherford of Genesis and Mike + the Mechanics is also famous for his use of a double-neck guitar during live shows. Don Felder of the Eagles used the Gibson EDS-1275 during the Hotel California tour. Muse guitarist and vocalist Matthew Bellamy uses a silver Manson double-neck on his band's Resistance Tour. Rush guitarist Alex Lifeson is also known for using double-neck guitars in the live performance of several songs. In performances of the song "Xanadu" during the band's 2015 R40 anniversary tour, Lifeson played a white Gibson EDS-1275 double-neck guitar with six-string and twelve-string necks, while bassist Geddy Lee performed with a double-neck Rickenbacker guitar with four-string bass and twelve-string guitar necks. Woods typically used in solid-body electric guitars include alder (brighter, but well rounded), swamp ash (similar to alder, but with more pronounced highs and lows), mahogany (dark, bassy, warm), poplar (similar to alder), and basswood (very neutral). Maple, a very bright tonewood, is also a popular body wood, but is very heavy. For this reason it is often placed as a "cap" on a guitar made primarily of another wood. Cheaper guitars are often made of cheaper woods, such as plywood, pine or agathis—not true hardwoods—which can affect durability and tone. Though most guitars are made of wood, any material may be used. Materials such as plastic, metal, and even cardboard have been used in some instruments. The guitar output jack typically provides a monaural signal. Many guitars with active electronics use a jack with an extra contact normally used for stereo. These guitars use the extra contact to break the ground connection to the on-board battery to preserve battery life when the guitar is unplugged. These guitars require a mono plug to close the internal switch and connect the battery to ground. Standard guitar cables use a high-impedance 1⁄4 inch (6.35 mm) mono plug. These have a tip and sleeve configuration referred to as a TS phone connector. The voltage is usually around 1 to 9 millivolts. A few guitars feature stereo output, such as Rickenbacker guitars equipped with Rick-O-Sound. There are a variety of ways the "stereo" effect may be implemented. 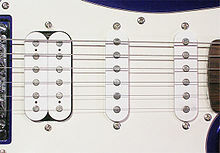 Commonly, but not exclusively, stereo guitars route the neck and bridge pickups to separate output buses on the guitar. A stereo cable then routes each pickup to its own signal chain or amplifier. For these applications, the most popular connector is a high-impedance 1⁄4 inch (6.35 mm) plug with a tip, ring and sleeve configuration, also known as a TRS phone connector. Some studio instruments, notably certain Gibson Les Paul models, incorporate a low-impedance three-pin XLR connector for balanced audio. Many exotic arrangements and connectors exist that support features such as midi and hexaphonic pickups. A floating or trapeze tailpiece (similar to a violin's) fastens to the body at the base of the guitar. These appear on Rickenbackers, Gretsches, Epiphones, a wide variety of archtop guitars, particularly Jazz guitars, and the 1952 Gibson Les Paul. Pictured is a tremolo arm or vibrato tailpiece style bridge and tailpiece system, often called a whammy bar or trem. It uses a lever ("vibrato arm") attached to the bridge that can temporarily slacken or tighten the strings to alter the pitch. A player can use this to create a vibrato or a portamento effect. Early vibrato systems were often unreliable and made the guitar go out of tune easily. They also had a limited pitch range. Later Fender designs were better, but Fender held the patent on these, so other companies used older designs for many years. Detail of a Squier-made Fender Stratocaster. Note the vibrato arm, the 3 single-coil pickups, the volume and tone knobs. With expiration of the Fender patent on the Stratocaster-style vibrato, various improvements on this type of internal, multi-spring vibrato system are now available. Floyd Rose introduced one of the first improvements on the vibrato system in many years when, in the late 1970s, he experimented with "locking" nuts and bridges that prevent the guitar from losing tuning, even under heavy vibrato bar use. The fourth type of system employs string-through body anchoring. The strings pass over the bridge saddles, then through holes through the top of the guitar body to the back. The strings are typically anchored in place at the back of the guitar by metal ferrules. Many believe this design improves a guitar's sustain and timbre. A few examples of string-through body guitars are the Fender Telecaster Thinline, the Fender Telecaster Deluxe, the B.C. Rich IT Warlock and Mockingbird, and the Schecter Omen 6 and 7 series. Pickups on a Fender Squier "Fat Strat" guitar—a "humbucker" pickup on the left and two single-coil pickups on the right. Because of their natural inductive qualities, magnetic pickups tend to pick up ambient, usually unwanted electromagnetic interference or EMI. This mains hum results in a tone of 50 or 60 cycles per second depending on the powerline frequency of the local alternating current supply. The resulting hum is particularly strong with single-coil pickups. Double-coil or "humbucker" pickups were invented as a way to reduce or counter the sound. The high combined inductance of the two coils also leads to the richer, "fatter" tone associated with humbucking pickups. Electric guitar necks vary in composition and shape. The primary metric of guitar necks is the scale length, which is the vibrating length of the strings from nut to bridge. A typical Fender guitar uses a 25.5-inch (65 cm) scale length, while Gibson uses a 24.75-inch (62.9 cm) scale length in their Les Paul. While the scale length of the Les Paul is often described as 24.75 inches, it has varied through the years by as much as a half inch. An electric guitar with a folding neck called the "Foldaxe" was designed and built for Chet Atkins by Roger C. Field. Steinberger guitars developed a line of exotic, carbon fiber instruments without headstocks, with tuning done on the bridge instead. Fingerboards vary as much as necks. The fingerboard surface usually has a cross-sectional radius that is optimized to accommodate finger movement for different playing techniques. Fingerboard radius typically ranges from nearly flat (a very large radius) to radically arched (a small radius). The vintage Fender Telecaster, for example, has a typical small radius of approximately 7.25 inches (18.4 cm). Some manufacturers have experimented with fret profile and material, fret layout, number of frets, and modifications of the fingerboard surface for various reasons. Some innovations were intended to improve playability by ergonomic means, such as Warmoth Guitars' compound radius fingerboard. Scalloped fingerboards added enhanced microtonality during fast legato runs. Fanned frets intend to provide each string with an optimal playing tension and enhanced musicality. Some guitars have no frets—and others, like the Gittler guitar, have no neck in the traditional sense. While an acoustic guitar's sound depends largely on the vibration of the guitar's body and the air inside it, the sound of an electric guitar depends largely on the signal from the pickups. The signal can be "shaped" on its path to the amplifier via a range of effect devices or circuits that modify the tone and characteristics of the signal. Amplifiers and speakers also add coloration to the final sound. Modern electric guitars most commonly have two or three magnetic pickups. Identical pickups produce different tones depending on location between the neck and bridge. Bridge pickups produce a bright or trebly timbre, and neck pickups are warmer[when defined as?] or more bassy. The type of pickup also affects tone. Dual-coil pickups sound warm, thick, perhaps even muddy; single-coil pickups sound clear, bright, perhaps even biting. 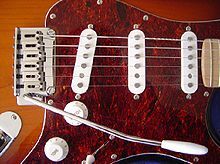 Where there is more than one pickup, a switch selects between the outputs of individual pickups or some combination; two-pickup guitars have three-way switches, and three-pickup guitars have five-way switches. Further circuitry sometimes combines pickups in different ways. For instance, phase switching places one pickup out of phase with the other(s), leading to a "honky", "nasal", or "funky" sound. Individual pickups can also have their timbre altered by switches, typically coil tap switches that effectively short-circuit some of a dual-coil pickup's windings[vague] to produce a tone similar to a single-coil pickup (usually done with push-pull volume knobs). The final stages of on-board sound-shaping circuitry are the volume control (potentiometer) and tone control (a low-pass filter which "rolls off" the treble frequencies). Where there are individual volume controls for different pickups, and where pickup signals can be combined, they would affect the timbre of the final sound by adjusting the balance between pickups from a straight 50:50. The solid-body electric guitar does not produce enough sound for an audience to hear it in a performance setting unless it's electronically amplified—plugged into an amplifier, mixing console, or PA. Guitar amplifier design uses a different approach than sound reinforcement system power amplifiers and home "hi-fi" stereo systems. Audio amplifiers generally are intended to accurately reproduce the source signal without adding unwanted tonal coloration (i.e., they have a flat frequency response) or unwanted distortion. In contrast, most guitar amplifiers provide tonal coloration and overdrive or distortion of various types. A common tonal coloration sought by guitarists is rolling off some of the high frequencies. Guitar amplifiers generally incorporate at least a few effects, the most basic being tone controls for bass and treble. There may be some form of "overdrive" control, where the preamplifier's output is increased to the point where the amplitude overloads the input of the power amplifier stage, causing clipping. In the 1960s, the tonal palette of the electric guitar was further modified by introducing effect units in the signal path before the amplifier. Effects units have been created in several formats, the most common of which are the stompbox "pedal" and the rackmount unit. A stomp box (or pedal) is a small metal or plastic box containing the circuitry, which is placed on the floor in front of the musician, and is activated by one or more switches intended to be pressed with the foot. Pedals are smaller than rackmount effects. A rackmount effects unit may contain an electronic circuit nearly identical to a stompbox-based effect, but cased to be mounted in a standard equipment rack. Rack-mount effects units often contain several types of effect. They are controlled by knobs or switches on the front panel or by a MIDI digital control interface. A multi-effects device is a single electronics effects pedal or rack-mount device that contains many electronic effects. Most of these devices allow users to use "pre-set" their desired combinations of effects, offering the ability to easily alter the guitar's tonal dynamics, even mid-song. Some multi-FX pedals contain modelled versions of well-known effects pedals or amplifiers. The Boss GT-8, a higher-end multi-effect processing pedal; note the preset switches and patch bank foot switches and built-in expression pedal. By the 1990s, software effects became capable of digitally replicating the analog effects used in the past, with varying degrees of quality. Many techniques, such as axial finger vibrato, pull-offs, hammer-ons, palm muting, harmonics and altered tunings, are also used on the classical and acoustic guitar. Shred guitar is a genre involving a number of extended techniques. ^ Hempstead, Colin; Worthington, William E. (2005). Encyclopedia of 20th-Century Technology, Volume 2. Taylor & Francis. p. 793. ISBN 1-57958-464-0. ^ a b Wheelwright, Lynn; Carter, Walter (28 April 2010). . Vintage Guitar. Retrieved 10 July 2014. ^ Center, Lemelson. "Invention: Electric Guitar". www.invention.si.edu. Lemelson Center for the Study of Invention and Innovation. Retrieved 21 July 2018. ^ a b Wheeler, Tom (1978). The Guitar Book: A Handbook for Electric & Acoustic Guitarists. Harpercollins. p. 153. ISBN 0-06-014579-X. ^ Smith, Richard R. (1987). The History of Rickenbacker Guitars. Centerstream Publications. p. 10. ISBN 978-0-931759-15-4. ^ "Guitar E – berichte und fotos". viewgoods.de. Archived from the original on 25 October 2011. Retrieved 18 May 2011. ^ Evans, Tom (1977). Guitars: Music, History, Construction and Players from the Renaissance to Rock. Paddington Press. p. 344. ISBN 0-448-22240-X. ^ a b c Editorial, Retrofret. "An Important and Historical Instrument". Retrofret Vintage Guitars. Retrofret. Retrieved 16 March 2017. ^ a b c Corporation, Richenbacker International. "The Earliest Days of the Electric Guitar". Rickenbacker. RIC. Retrieved 8 August 2015. ^ a b c USPTO, USPTO. "Stringed Instrument (Tremolo)". Google Patents. USPTO. Retrieved 8 August 2016. ^ a b c USPTO, USPTO. "Electric Stringed Musical Instrument". google.patents. USPTO. Retrieved 8 August 2016. ^ Maloof, Rich. "Who Really Invented the Electric Guitar". Reverb.com. Reverb.com. Retrieved 21 July 2018. ^ a b c d Writer, Staff. "Rickenbacker Ken Roberts Model Hollow Body Electric Guitar". Retrofret.com. Retrofret.com. Retrieved 21 July 2018. ^ USPTO, USPTO. "Apparatus for producing tremolo effects". US Patent Trade Mark Office. USPTO. Retrieved 21 July 2018. ^ D'arcy, David (12 November 2000). "ART/ARCHITECTURE; Strummed by One Hand, Sculptured by Another". The New York Times. Retrieved 2 May 2010. ^ Ed Mitchell (Total Guitar) (28 December 2011). "IN PRAISE OF: The Fender Stratocaster | IN PRAISE OF: The Fender Stratocaster". MusicRadar. Retrieved 14 December 2013. ^ "O. W. Appleton Home Page". Worldwide Filmworks. 2012. Retrieved 25 July 2013. ^ Wheeler, Tom (1982). American Guitars: An Illustrated History. Harper & Row. p. 8. ISBN 0060149965. ^ Ross, Michael. "Forgotten Heroes: Paul Bigsby". Premier Guitar. Retrieved 19 October 2015. ^ Ratcliffe, Alan (2005) Electric Guitar Handbook, UK: New Holland Publishers, p. 11. ISBN 1-84537-042-2. ^ a b "Guitar World Magazine Tolinkski and Di Perna". 2017. Retrieved 17 April 2018. ^ "Companies selling Models of Guitars". 2018. Retrieved 17 April 2018. ^ "Companies selling Models of Guitars 2". 2018. Retrieved 17 April 2018. ^ "Does my Les Paul have weight relief holes or sound chambers?". lespaulforum.com. ^ Irizarry, Rob (5 March 2007) Making Electric Guitars That Won't Break Your Back. Building the Ergonomic Guitar. ^ Bartolo, Joel Di. Serious Electric Bass: The Bass Player's Complete Guide to Scales and Chords. Alfred Music. p. 7. ISBN 1457460963. Retrieved 26 July 2015. ^ Hunter, Dave (2006). The Electric Guitar Sourcebook: How to Find the Sounds You Like (1. ed.). San Francisco: Backbeat. p. 20. ISBN 0879308869. ^ "Electric Guitar (Les Paul model) by Gibson, Inc., Kalamazoo, 1952". Orgs.usd.edu. Retrieved 8 November 2012. ^ Vassilis Lembessis, Dr. (1 July 2001). "Physics... in action". Europhysics News. 32 (4): 125–125. doi:10.1051/epn:2001402. ISSN 0531-7479. ^ Lemme, Helmuth. "The Secrets of Electric Guitar Pickups" (PDF). Build Your Guitar. Electronic Musician. Retrieved 15 April 2016. ^ Cochran, Russ and Atkins, Chet (2003). Chet Atkins: Me and My Guitars, Hal Leonard, p. 124, ISBN 0-634-05565-8. Wikimedia Commons has media related to Electric guitars. This page was last edited on 17 April 2019, at 04:35 (UTC).